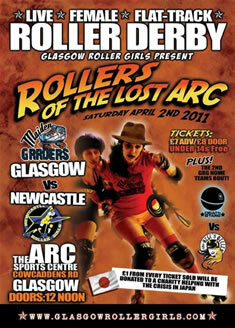 We’re packing the bus & hitting the North for maybe our toughest bout yet, as NRG take on Glasgow’s mighty Maiden Grrders. The Arc Sports Centre on Cowcaddens Road will be shaken to its foundations as these two tough teams of brawling bruisers battle it out. Buoyed by their recent scorching home win against Granite City Roller Girls of Aberdeen, can Newcastle take it over the border score their 1st victory on Scottish soil? Or will they be dashed against the Maidens’ legendary walls of steel? Get yourself to Glasgow for the clash of Clyde vs Tyne.